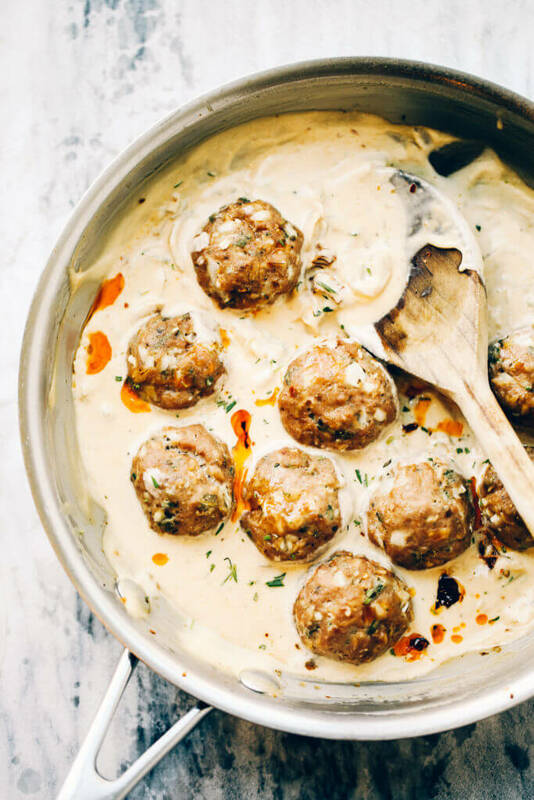 Breakfast meatballs. Is that a thing? If not, I just made it a thing today. And no regrets, because these were DELICIOUS! Packed full of fresh rosemary, sage, and thyme- you’re gonna love them (or at least, I hope you do… 🙂 ). 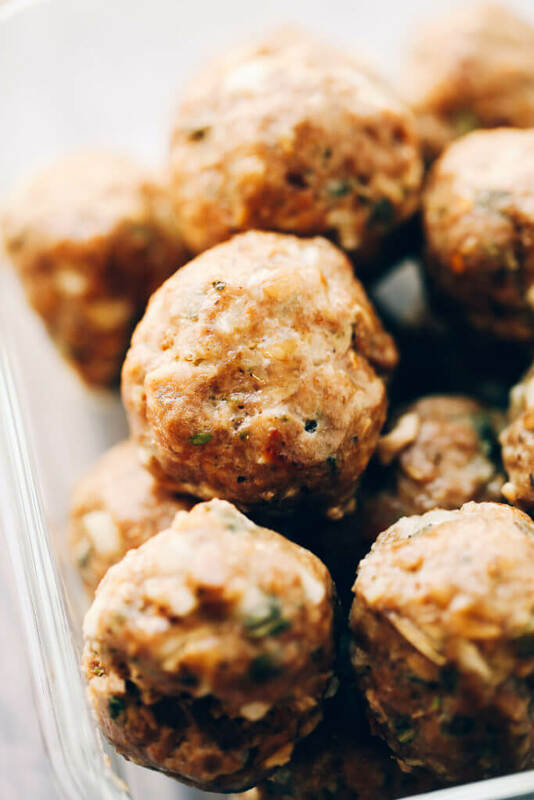 Savory breakfasts: sage “sausage” meatballs! I am like, waaaay into savory breakfasts! The way I see things, it’s like, save best for last; more like eat the best for breakfast, then do that again for lunch, and on repeat for dinner! Savory breakfasts are my jam. Whether that’s from years of my Mom instilling this into my head as a kid- swapping out of bowls of cereal for bowls of soup. Or just the fact that I love, love kale, avocados, and greens, and two meals a day with them just isn’t enough! 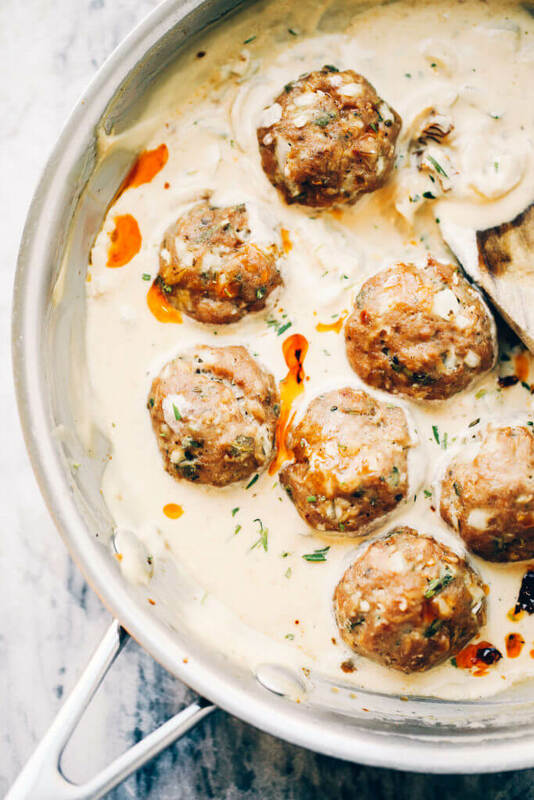 Anyway,… Things kinda spiraled and got out of control as you can see… savory breakfast meatballs with cream sauce (oh it’s good!). And if you are a little shy about trying savory for breakfast, this recipe can be served over a bed of sautéed kale and cauliflower rice for lunch or dinner! This recipe was inspired by my turkey sausage patties. They are easy, quick, convenient and a great source of protein! Especially, since I’m not too into the whole red meat thing (wish I liked it better!) Turkey is a great protein to have on rotation in my house. And I looove it! I love it! I like to prep this recipe (minus the sauce) and store them in glass lock containers in the fridge, for easy meal prep throughout the week! 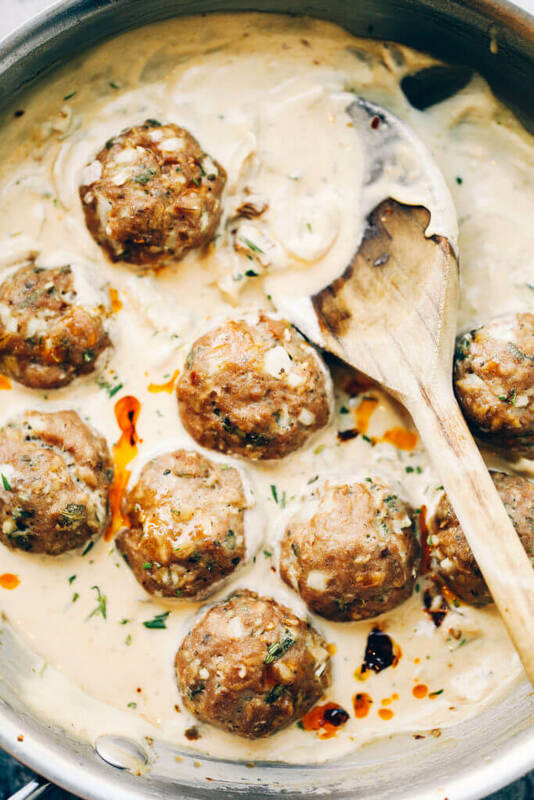 Trust me, these savory meatballs are a life saver when you need dinner on demand! And they make a mean turkey meatball sandwich! These are the glass containers I love using for meal prep with this recipe! I can’t eat almond flour – what do you recommend for a whole30 substitute? Hi Caroline, you can use hazelnut flour or oat flour. I made these tonight and they were delicious! My husband isn’t paleo or GF and he loved them too which is always a plus! I added some tapioca starch to the sauce to thicken it a bit (we like a thicker sauce). 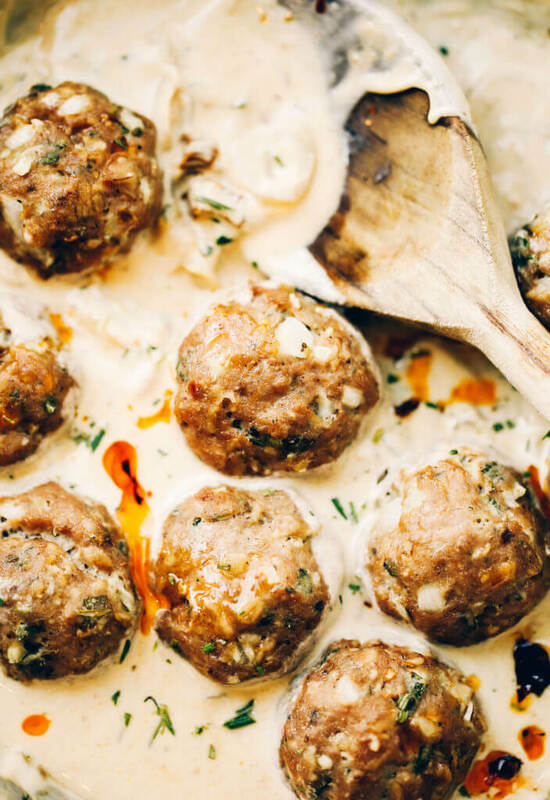 So flavorful, the meatballs are great on their own! Um… there is no sage in this recipe. Hi Patty, you may have missed it- it calls for 1/4 cup fresh sage :). Hi Patty, there is 1 tablespoon fresh sage in the sauce as well. 🙂 Hope that helps! Looks delicious! I couldn’t get the sauce to thicken up! Otherwise it’s great! If I were to sub coconut flour for almond what would that do rest of the recipe? My daughter has a nut allergy. They look yummy and a great way to expand the kids typical dinner choices. Hi Diane, that wouldn’t work because coconut flour is much different than almond flour (it absorbs liquid and is grainy), but oat flour would work great- is that an option? How many servings does this dish make? Are the nutrients listed per meatball? Hi Kelsey, it makes 24 meatballs with sauce- each serving a 1 meatball and sauce to go with it! For the nutrition info, how many meatballs in one serving? Thank you! Nevermind. Just saw the comment above. Thanks! 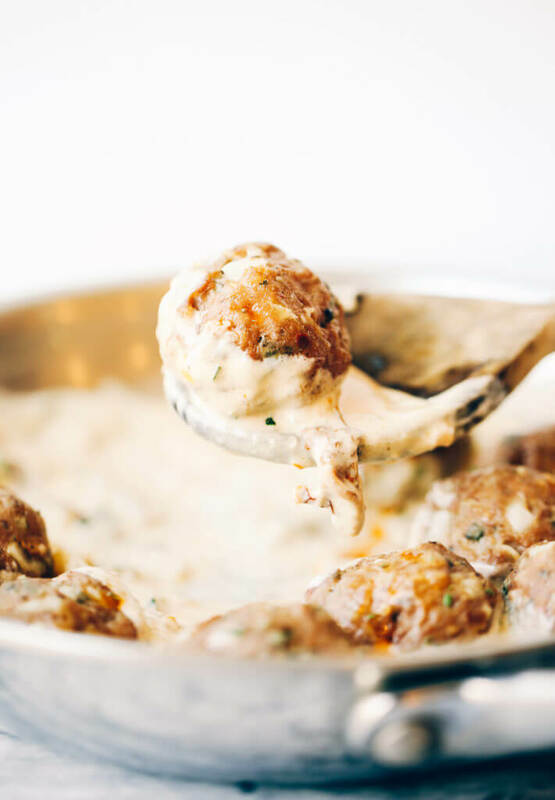 Hi Jill, it’s one meatball + cream sauce. 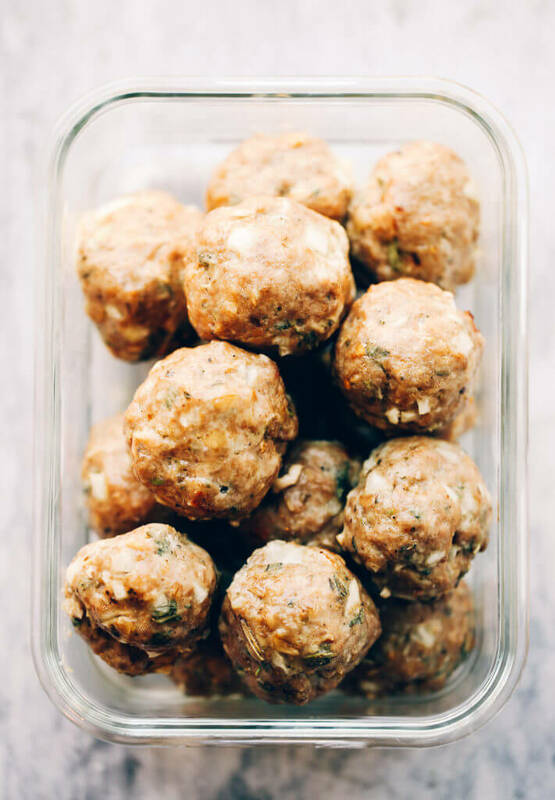 Can I use dried sage in the meatballs? I don’t have any fresh. Hi Jennifer, that may change the recipe a bit- I wouldn’t use as much dried sage, but it should still work! Hey Kaylie, I don’t drink coconut milk, would almond milk work the sauce or would it make it taste completely different? Thanks! I just had another reader say they used cashew milk with arrowroot to thicken and it worked! I haven’t tried that myself, but others have said it works. Hope that helps! 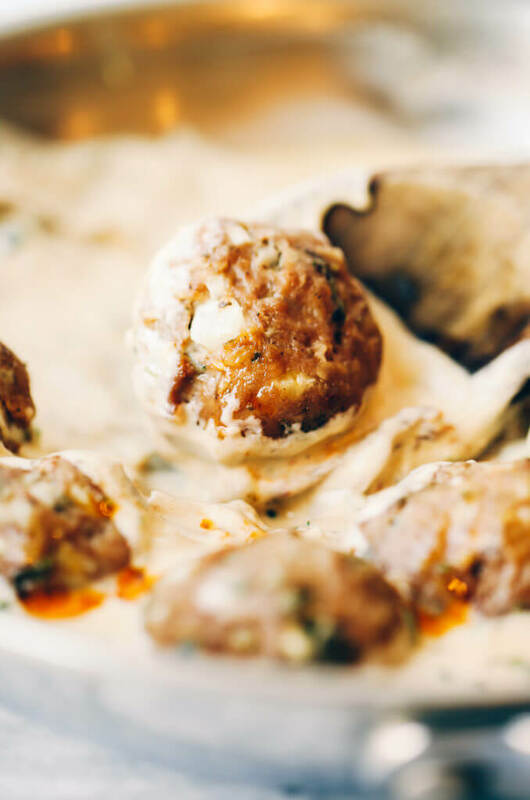 We made this recipe a couple nights ago and it was a huge hit! We served it over brown rice fettuccini, but I’m hoping to try it over sautéed zucchini noodles in the future. SO flavorful and so happy to have something so delicious, flavorful and CREAMY even though I’m limiting dairy! Please keep posting recipes, we love them! Thank you!! Love hearing this! Hi there, would it be ok to use dry herbs for this recipe? I have a hard time using all my fresh herbs before they go bad. Hi Michelle, that should work, I haven’t tried it though. We just made this tonight and I used dried powdered sage. 1 Tablespoon was enough bc dried herbs are strong. I also used red onion instead of white or yellow, and because we have a large family we also added 1 pound of organic chicken sausage in the sauce while it boiled. For those of you looking for an alternate to almond flour you can also use cassava. We served it over roasted spaghetti squash. Yum!!! Made this tonight and it is delicious!!!!!! Hi Kaylie! This looks AMAZING! I know you already answered a million variations of this question, but does regular flour work for am almond flour substitute? I have no dietary restrictions! Made these for the family the other night after work, super simple. My hubby told me 5x how much he liked them. Thanks for the wonderful addition to my menu! So good thank you for the recipe! I fried some sage for a topping along with some walnuts. Hi Kaylie. I’ve subscribed as a Patreon and got the shopping list but it seems a little confusing. Is there a week by week shopping one? And are the other weeks available as well? Hi Marisa, the shopping list is for week one of the meal plan. Hi Kaylie, made this tonight and it turned out delicious! I forgot, however, to add the almond flour and didn’t notice until the meatballs were already done. Just curious what adding the flour does being I thought they turned out perfectly fine with the missing ingredient. I’ve never used coconut milk to make a cream sauce, does it have a coconutty flavor? Whenever you say sun dried tomatoes to your taste, how much should I add in the sauce?? Hi Tiffany, I add about 2 tablespoons. Thanks, Kaylie! Would arrowroot flower work with this? Or Bob’s Paleo flour mix? Do you know the calories, protien, fat and carbs content?? The nutritional info please. I made it tonight, delicious! I made this last night and it was absolutely delicious! I wanted to have it for breakfast this morning, but that would mean I couldn’t have it for lunch so I’m expectantly waiting. Thank you for your awesome recipes! I made this last night and it was DELICIOUS!!! I’m loving coconut milk for many things on my whole 30, but I was a little wary about it as a cream sauce. But with all of the added flavor, it was so savory and delicious. I did use ground turkey AND ground pork for a little kick. I’ve come back today to peruse your other recipes. Thanks for this one though, it’ll definitely make it’s way onto our table again. I loved this recipe! I wrapped the balls in cabbage for an added veggie and baked them as cabbage rolls. Also I added some coconut aminos for a little deeper flavor in the sauce. So so good! How can this be made in the instapot? Hi Bridget, I haven’t ever cooked with an instant pot, so I couldn’t say. Sorry! Hi, this might be a silly question but does the coconut milk leave a strong coconut flavor? I tried a recipe once and it was just too overpowering! This recipe looks amazing! I made this recipe tonight for the first time and it was delicious! My entire family loved it. I have just one question about the meatballs: do you brown them before putting them in the oven? I didn’t brown them first and my meatballs weren’t cooked through at the 20 minute mark. I ended up leaving them in the oven for 45 minutes and I still would have liked them a bit more well done. Thank you! Hi Joy, I don’t brown my meatballs before going in the oven. Made these and am in love!! How long does the cream sauce last? 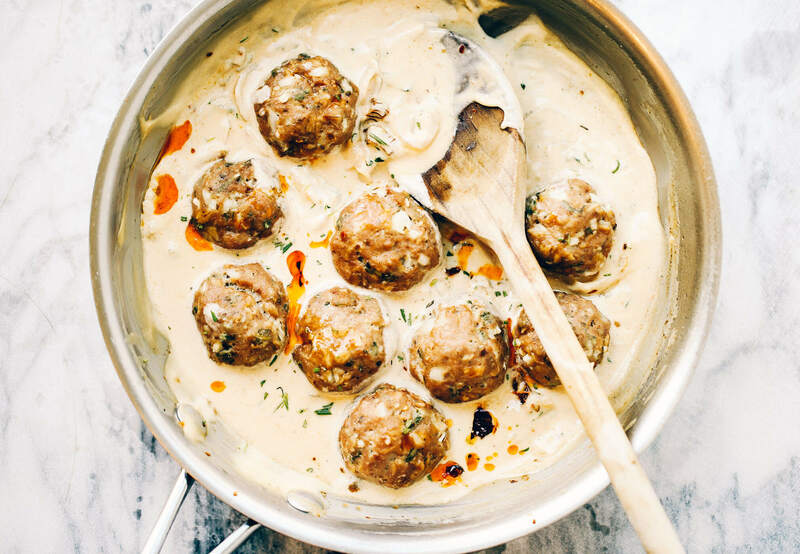 I’m prepping the meatballs and freezing for my meal plan but wondering if the sauce would freeze well too. WHAT ARE SOME GOOD VEGGIES TO GO WITH THIS RECIPE? Hi Maria, sautéed zucchini or asparagus would be yummy! Wow! The sauce is amazing! I will be making other proteins with it! Even my cheeseburger and pizza loving husband thought it was absolutely delicious! Thank you! Great to hear, thank you Linda!